To create a sportier look for the all-new Escape, designers turned to some of the most high-profile sports cars in the Ford showroom. 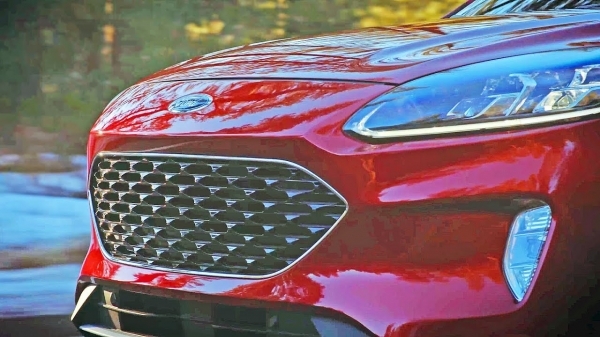 The shield-shaped trapezoidal grille is inspired by the sixth-generation Mustang, while the lower front end borrows from Ford GT. Compared to the current model, the all-new Escape stands lower, wider and longer. The new 2.0-liter EcoBoost engine, available on Titanium, is projected to produce 250 horsepower and 275 lb.-ft. of torque using 93 octane fuel, while turning in a 0-60 mph time up to 10 percent faster than the outgoing Escape 2.0-liter. When properly configured, it is rated to tow 3,500 pounds. The all-new 1.5-liter EcoBoost, standard on S, SE and SEL, is projected to produce 180 horsepower and 177 lb.-ft. of torque using 93 octane fuel. When properly configured, it is rated to tow 2,000 pounds. To help conserve fuel, the 1.5-liter EcoBoost debuts cylinder deactivation, a Ford first for North America, which senses when one cylinder isn’t needed and shuts it down automatically. The system can activate or deactivate a cylinder in 14 milliseconds to maintain a smooth ride. SE Sport and Titanium models come standard with Ford’s innovative fourth-generation hybrid propulsion system, which includes an all-new 2.5-liter Atkinson cycle hybrid engine and electronic continuously variable transmission. The front-wheel-drive hybrid model is projected to produce a combined system horsepower of 198, and a top speed of 85 mph in electric-only mode. The plug-in hybrid variant, available on every trim level except S and SE Sport, projects a best-in-class EPA-estimated range of at least 30 miles in electric-only mode. Escape Plug-In Hybrid has a Level 1 / Level 2 AC charging port. Using a 110-volt Level 1 charge, the estimated time to fully charge the battery is 10 to 11 hours. Using a 240-volt Level 2 charge, charge time drops to roughly 3.5 hours.